I actually have a menu for dinner this week. It stems from eating out way too much last week. We want to try to eat at home as much as possible this week. 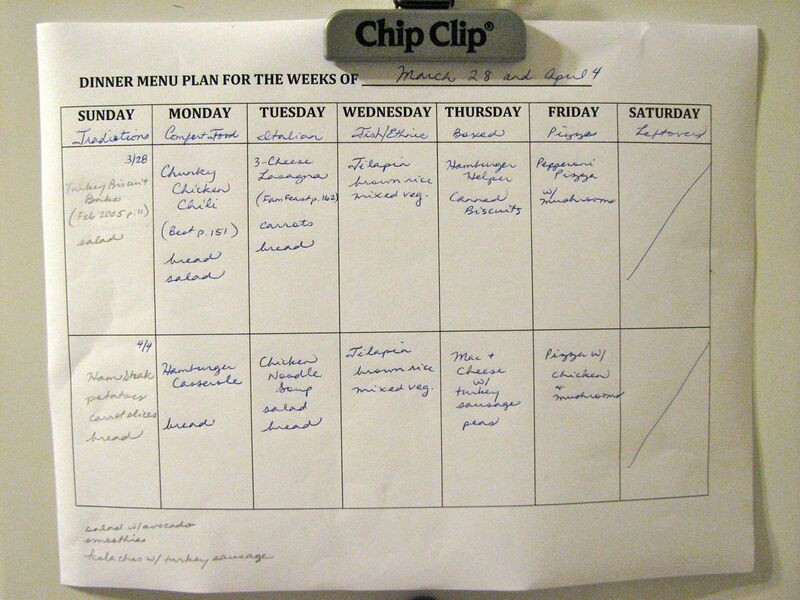 I planned the menu with a blank Food Nanny menu plan and Food Nanny theme nights. Some of the meals are from or based on recipes in the Food Nanny cookbook. I planned meals for 5 days this week as a way of getting back into the swing of things. I haven’t done much in the way of meal planning or cooking for a while. Hooray! I finally did a menu again! It’s been so long! I made a list of meals for the week and went shopping for the ingredients. I even planned out weekly breakfasts! For more menu ideas, go to Org Junkie. Special Thanks to Cindy’s Porch for meal calendars and menu ideas.